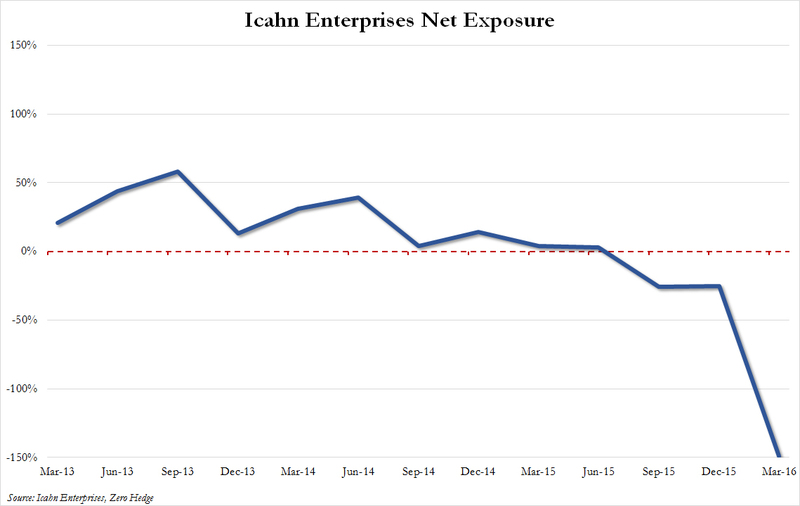 One month ago, we were stunned to report that none other than billionaire Carl Icahn had taken the net exposure of his hedge fund, Icahn Enterprises, from a modest net 25% short - his recent negative bias on the market was hardly a secret - to a practically apocalyptic, 149% net short which is about as close to betting on a market crash as one could get. Then last month, billionaire trader Stanley Druckenmiller warned that “the bull market is exhausting itself” and in a presentation titled "The Endgame", he explained why he too is dumping equities and buying gold. It turns out Icahn and Druck weren't the only iconic traders betting on a market crash. In a stunning one-two revelation, the WSJ reports that after a nearly decade-long hiatus, not only has George Soros returned to trading, "lured by opportunities to profit from what he sees as coming economic troubles", but that he has personally directed "a series of big, bearish investments", meant to profit from the coming economic turmoil . The last time Soros became closely involved in his firm’s trading: 2007, "when he became worried about housing and placed bearish wagers." Over the next two years the bets netted more than $1 billion of gains. According to the WSJ's Greg Zuckerman, Soros Fund Management, which manages $30 billion for Mr. Soros and his family, sold stocks and bought gold and shares of gold miners, anticipating weakness in various markets. Investors view gold as a haven during times of turmoil. The move is rather shocking for the 85 year old, who earned fame with a bet against the British pound in 1992, a trade that led to $1 billon of profits. In recent years the billionaire has focused on public policy and philanthropy. He is also a large contributor to the super PAC backing presumptive Democratic nominee Hillary Clinton and has donated to other groups supporting Democrats. It appears he was also bored. While Soros has always closely monitored his firm’s investments, as he got older he would delegate more and more, with many of his proteges moving on to start their own hedge funds, Trump's fundraiser Steven Mnuchin being just one example. As a result, in recent years, he hasn’t done as much investing of his own. That however has now changed and as the WSJ notes, recently Soros has been spending more time in the office directing trades. He has also been in more frequent contact with the executives, the people said. According to the WSJ, Soros is stepping into a void at his firm. Last year, Scott Bessent, who served as Soros’s top investor and has a background in macro investing, or anticipating macroeconomic moves around the globe, left the firm to start his own hedge fund. Soros has invested $2 billion with Mr. Bessent’s firm, Key Square Group. Later in 2015, Mr. Soros tapped Ted Burdick as his chief investment officer. Mr. Burdick has a background in distressed debt, arbitrage and other types of trading, rather than macro investing, Mr. Soros’s lifelong specialty. Which is why Soros felt comfortable stepping back in, and - as it turns out - it was to begin building a major bearish position. "Soros’s recent hands-on approach reflects a gloomier outlook than many. His worldview darkened over the past six months as economic and political issues in China, Europe and elsewhere have become more intractable. While the U.S. stock market has inched back toward records after troubles early this year and Chinese markets have stabilized, Mr. Soros said he remains skeptical of the Chinese economy, which is slowing." While we documented Soro's pessimism about China earlier in the year, it appears to have only gotten worse, and as Soros said, "the fallout from any unwinding of Chinese investments likely will have global implications." China will hardly be amused, and will promptly seek to muzzle any media outlets reporting Soros' renewed pessimism toward China's "recovery." It will hardly help its situation. Finally, there is the US. Soros also adopted bearish derivative positions that serve as wagers against U.S. stocks. It isn’t clear when those positions were placed and at what levels during the first quarter, but the S&P 500 index has climbed 3% since the beginning of the second period, suggesting Mr. Soros could be facing losses on some of those moves. Unless, of course, the puts are longer-dated and the market does in fact proceed to crash. Overall, the Soros fund is up a bit this year, in line with most macro hedge funds, according to people close to the matter. The investments by the firm were previously disclosed in filings, but it wasn’t clear how involved Mr. Soros was in the decisions spurring the moves. The WSJ concludes by pointing out that the last time Soros became closely involved in his firm’s trading: 2007, when he became worried about housing and placed bearish wagers over two years that netted more than $1 billion of gains. And now, a very bearish Soros is back again.